Corrie ten Boom’s powerful true story of family, love and courage, during WW2 and the Nazi occupation of Holland… one of the darkest times in world history… has inspired millions around the world for decades. 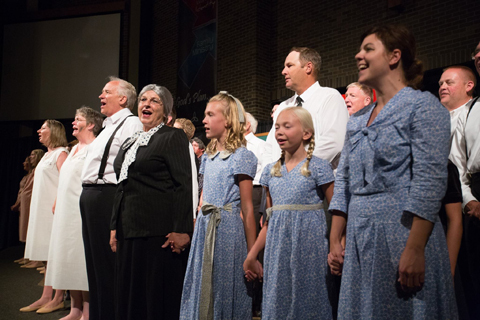 Ten Boom the Musical, adapted from her autobiographical book, “The Hiding Place,” remembers the courage and faith that sustained Corrie and her sister Betsie, who brought light and hope to many in the notorious Ravensbruck concentration camp. That even in the darkest place, love and faith triumphs! In 2010 the Ten Boom Script, including original songs and sound effects, was recorded in Nashville, Tennessee and sent to many friends and professionals for comment. Since “Ten Boom the Musical” has taken to the stage, the wonderful comments keep coming! The writing of “Ten Boom the Musical” began with a love of Corrie’s amazing story, then two sisters researching many of Corrie’s books. Lists of subject matter for possible scenes and songs were collected, and the actual writing of the script began in 1997. We’ve watched several performances of “Ten Boom the Musical” now, and not a few miracles in the process… people too well-placed and events too memorable to be happenstance. We want to share here about those, and more as we continue this adventure. Every performance of our play has been a great learning experience for us, every scene and character, so known to us in the writing of it, is like a new creation in the hands of talented actors and singers. These are some pictures, places and experiences from those performances. Ten Boom the Musical is based on the true story of Corrie ten Boom and her family whose faith, and courage to risk their very lives, found them embroiled in intrigue during WW2. The time of our story is 1937 to 1945. The ten Boom’s live peaceful lives above the family watch shop in Haarlem, Holland (The Netherlands) until the Nazis invade their beloved homeland and life becomes a dangerous mission to hide more than 800 Jews from persecution and certain death. How can I present “Ten Boom the Musical” at my venue or church? Download PDF Script. Includes recommended directions and choreography for presentation of “Ten Boom the Musical” at your church or other venue. For further interpretation, call play writers for consultation. Listen to demos of the 14 Original Songs from the play. Includes song lyrics & descriptions. Lead sheets and full orchestrations available for performing venues. Download (with permission) all production & promotional graphics, sound effects, and other related materials. Coming soon! © 2010 and 2012 Baton Rouge Publishing, Nashville TN. All Rights Reserved. Play may not be performed, copied, or distributed without written permission. Contact us for Performance Licensing and other materials.